This holiday rental apartment is located in family-friendly Tavira Garden, a luxurious Swedish-developed holiday apartment rental complex in the old Roman town of Tavira. Set in lush, mature gardens, Tavira Garden offers excellent vacation facilities including 2 adult pools, 2 kids pools, fitness room, tennis, boules, 2 kids play areas, BBQ areas, ample safe parking, etc. 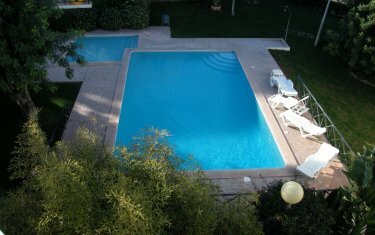 Tavira Garden 16A is a two bed, 2-bath, 90sqm/1000sqft, 2nd floor penthouse apartment with full air-con. 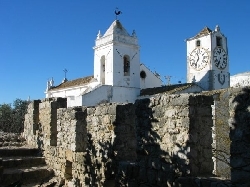 The old town of Tavira, with its Phoenician, Roman, Moorish, Crusader and other remains, and a Roman bridge still in everyday use, is only 30 minutes from Faro airport. 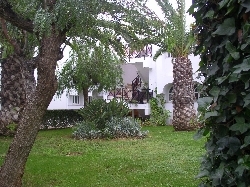 Tavira Garden is ~15 minutes on foot from the historic town centre. The town abounds with restaurants, old churches, bric-a-brac shops and boutiques, and the town council organises a steady stream of entertainment during the summer � street theatre, exhibitions, concerts, film festival, circus, etc. 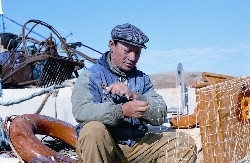 Fishing is still a major source of employment locally and this is reflected in the menus of the many reasonably priced restaurants. The nearby Ilha da Tavira (Tavira Island), reachjed by 5 to 10 minute ferry or water taxi ride, or by an old train straight out of a kids� cartoon, boasts 8 miles/12 km of some of the best and least crowded beaches in the Algarve. The Ria Formosa Nature Park, the historic and picturesque Guadiana Valley with its walled towns, and the Algarve hills, are all within easy reach. Express buses and trains permit day trips to Seville or Lisbon, and to the towns along the Algarve coast. Several golf courses are within 5 to 15 minutes drive � one hour will bring you to practically every well known course in the Algarve or to Isla da Canela and Islantilla just over the border in Spain. There are 2 bedrooms, a large lounge and a separate (but open-plan) dining room, and a separate kitchen, and is comprehensively equipped for 4 to 6 guests. The living area and both bedrooms are individually air-conditioned; with the exception of the kitchen, all windows are fitted with �blackout curtains�. Lounge, dining and kitchen are comprehensively equipped for up to six guests. Satellite TV includes UK Sky FTA + D/Es/Fr/NL/Pt channels; bring card for IE, S channels. There is a DVD player. WiFi internet is available free of charge at Reception; dedicated WiFi modem on request (GBP16/Euro20 with 720MB). 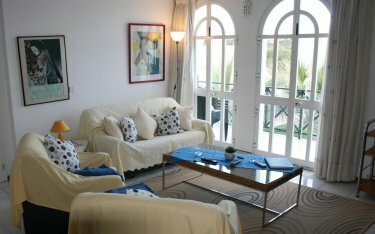 French windows open from lounge and double bedroom onto a large breakfast balcony. 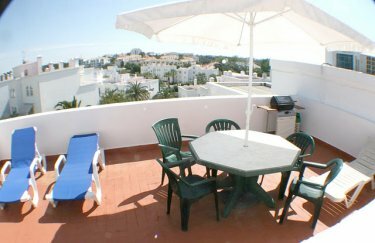 A private roof terrace (just a few steps away from the lounge is equipped with loungers, sun umbrella, dining table for six, gas BBQ, etc � and panoramic views to the Algarve hills, Tavira town and out to sea. The master bedroom has double bed, individual bedside tables and reading lamps, wardrobe, chest of drawers, mirror, etc. The second bedroom has twin beds with shared bedside locker and reading lamp, wardrobe, chest of drawers, mirror, etc. The living room includes a sofa-bed capable of accommodating two children or one adult; a camp-bed can also be provided. 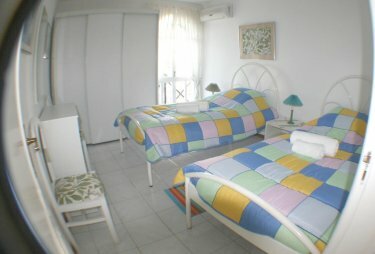 Bed-linen and towels are provided and changed each 6 to 8 days when the apartment is also cleaned. 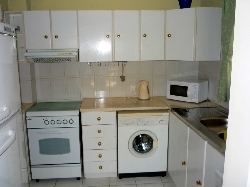 A full set of cooking utensils is provided and appliances include 4-plate electric hob + oven, microwave, cordless kettle, coffee percolator, toaster, juicer, blender, washing machine, fridge/freezer, dishwasher, vacuum cleaner, iron/board, drying frame, etc. There is no drier but the complex has a self service launderette where a drier may be used at a small charge. The access area for the apartment is pedestrianised with ample safe parking close by. The complex grounds, the gardens and the common areas are well lit at night. 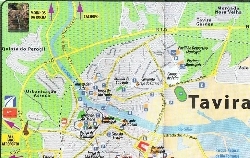 Both the complex and Tavira town generally are recognised as relatively safe and secure. Only 35 minutes from Faro airport, Tavira Garden is 15 minutes on foot from the old centre of the historic town of Tavira. Tavira boasts Phoenician, Roman, Moorish, Crusader and other remains � including a Roman bridge still in everyday use (but pedestrianised!). The town abounds with restaurants, old churches, bric-a-brac shops and boutiques, and the town council organises a steady stream of entertainment during the season � street theatre, exhibitions, concerts, folk music and dancing, film festival, circus, etc. Fishing is still a major local source of employment and this is reflected in the menus of the very reasonably priced restaurants. 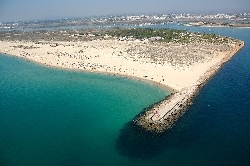 The nearby Ilha da Tavira (Tavira Island, reached by 10 minute ferry ride or by an old train straight out of a kids� cartoon) boasts 8 miles/12 km of some of the best and least crowded beaches in the Algarve. The Ria Formosa Nature Park, the historic and picturesque Guadiana Valley with its walled towns, and the Algarve hills, are all within easy reach. Express buses and trains permit day trips to Seville or Lisbon. Get WiFi Broadband Internet access code at Reception. Sauna and jacuzzi are in fitness room. Usage fees apply for tennis and fitness room. Quotes in Euro or other currency on request. Rates are based on party of four; 5th guest or 6th guest GBP 3,50 per night (incl cot, camp-bed or sofa-bed) but minimum charge one week (GBP 24,50). Except July, August Discount 20% applies to party of two, 10% to three. Discount 10% for each day in excess of seven. Second column of prices shows discounted cost for a party of two. NOTE: A Final Cleaning charge of GB30,00 applies to any rental less than one week and is included in the short stay figures above. Payment in GBP or Euro is by bank transfer. VISA/PayPal is available for other currencies. Aircon, Sat TV, communal WiFi Internet at Reception, etc included (a dedicated WiFi "HotSpot" can be provided in the apartment as an option at GBP20 for the first week). Bed-linen, towels changed and apartment cleaned each 6 to 8 days; no charge for final cleaning except for short lets less than one week (included in the 3 day rates above). Long Winter Lets (unserviced but fully equipped) Nov to March from GBP 420 (Euro 560 or $CA 750) per month plus water, electricity and final cleaning.